DIY 3D Printer Enclosure – My Build (Part 2) How I built my DIY 3D printer enclosure with tips and ideas how to build yours. Goes through the whole process from measure and design to build and finish with final thoughts. 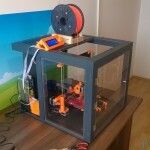 DIY 3D Printer Enclosure – Overview (Part 1) Why build a 3D printer enclosure? What things should be considered prior building? Read this overview of DIY enclosure to find out and build your own.